Bumper Crystal is a regenerant of gloss of plastic malls and bumpers and establish the ultra-hard glossy glass coating films on them. This product is different compared to other mall coating products, it is specifically for malls and bumpers to restore their original luster. It is easy to apply the product without coating unevenness by following the detailed instruction manual attached. Bumper Crystal is unlike other wax or coating products, malls and bumpers will not be whiten again after times passed from an application because Bumper Crystal maintains glossy looks for long time by creating the clear and hard glass coating film. The majority of mall and bumper wax and coating products (both personal and business uses) utilize petroleum as a main ingredient. Petroleum-based solvents are similar to tire wax and cannot avoid oxidization and deterioration. If those coatings are degraded by oxidization, they will be eventually removed by rain, furthermore, the remaining coatings create oily films so that a condition can be worse than before applying those petroleum-based products. 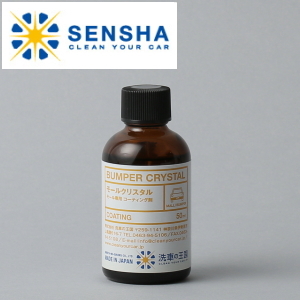 Bumper Crystal establishes the inorganic clear 9H hardness glass coating layer and it will never be oxidized and deteriorated hence problems petroleum-based products will never occur for glass coating products. Both glossy look and water repellency last for 1 Year from an application. With the hard glass coating, it protects malls and bumpers from scratches as well. Bumper Crystal is also to be applied to parts like below. Although a car has many unpainted plastic materials, one bottle (50ml) is adequate to for the entire glass coating. This product is for rough unpainted plastic materials, such as malls and bumpers. This product cannot be used on clear materials such as door visors and headlights. This product cannot be used for soft materials. It may cause cracks on the coating film. If an application (by one application) generates a too thick coating surface, the coating film may crack after hardening of the coating surface. Please wash and clean your car before an application. If you apply the product on top of dirt and scales, they cannot be removed after the application. The coating is very strong and hard. It will be impossible to remove the coating surface when it is cracked or containing dirt. It will take approximately 6 hours to harden and dry. Please do not drive the car and avoid the car getting wet. This product will harden when contacting with the air. It cannot be kept for log time after opening. Please finish using the product by applying 2-3 times. This will be very effective. Please read the instruction manual carefully before using.